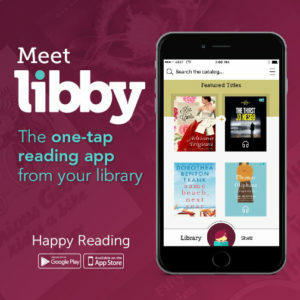 Download library ebooks and audiobooks with LIBBY by Overdrive. The LIBBY app is compatible with Anroid-powered Smartphones & tablets, Apple iPad, iPhone, & iPod Touch, Nook Samsung Galaxy Tab & Tablets, Windows 10 tablets, desktops, & laptops. INSTALL THE APP 1. On your device, go to the app store (Apple App Store or Google Play Store) and search for Libby. Install the free Libby app. 2. When you open the app for the first time, tap the word Hi. Then, scroll down and tap Find My Library. The app will use your location, or you can search by library name or zip code. Select Wisconsin Public Library Consortium as your library by tapping Yes. 1. Go to the Library (bottom left of screen) and search for book titles using several methods: Scroll down on the main page of Wisconsin’s Digital Library to see the list of collections. Choose a collection to browse books. or Use the Search option (magnifying glass) on the top of the page – enter a title, author or keyword. 2. When browsing or sorting through search results, you can refine what you see by tapping the + symbol in the center of the screen. 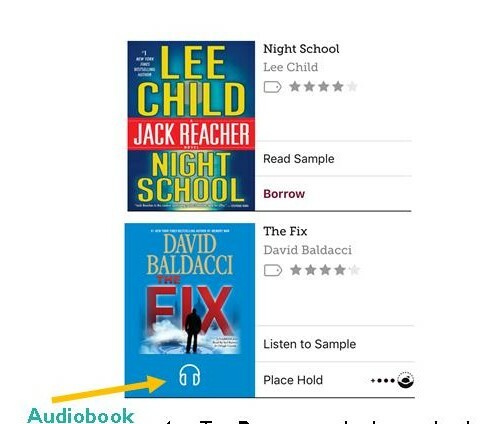 For example, you can change the availability to only see items that are currently available for checkout or sort results by popularity or by audiobook. 3. Note that items that are available for checkout will say Borrow by the title. If no copies are currently available, tap “Place Hold” to join the waiting list. Tap the book cover to find out more about a book. Audiobooks will have headphones on the cover. 4. Tap Borrow to check out a book. Note the lending period – tap on 7 Days to change your lending period. (7, 14 or 21 days for eBooks, 7 or 14 days for audiobooks). Libby will remember the last lending period that you used and use it next time by default. 5. Tap the Borrow button to complete the checkout. You can then open the book immediately, keep browsing for titles or go to your checkout Shelf. Tap on the book cover to begin reading or listening (audiobooks may take a few minutes to finish downloading). Enjoy! You can easily move between the Library, your Shelf or the last book that you opened by using the navigation on the bottom of the app. Reading or Listening to Books: When reading an eBook or listening to an audiobook, tap the center of the screen to open the Reader options. A progress bar will appear at the bottom of the screen. Tap the App Menu button in the upper right to access the table of contents, view your bookmarks or adjust your reading settings (such as font size and style). Tap the center of the screen again to hide the Reader options. Renewing Books: Titles without a waitlist are renewable starting three days before the end of your loan. In the Shelf, tap the cover of the book that you would like to renew. A menu with additional options and information will open – tap on Renew Loan. If you do not see the Renew Loan option, but instead see the phrase Place Hold, there is currently a waitlist for the title and you may place a hold instead of renewing. Returning Books Early: Books are automatically returned on their expiration date, so there is no need to manually return books. No overdue fees can accrue on library eBooks and digital audiobooks. If you would like to return a book early, tap on Shelf, then tap the cover of the book that you want to return. A menu with additional options will open – select Return to Library. Confirm by tapping Return. Picking Up Holds: An email will be sent to you when a hold is ready. By default, holds are automatically checked out to your card and will appear on your Shelf. Adjust Your App Settings: Adjust your Libby app settings by tapping on the App Menu button in the upper right corner of the screen when you are in the Library or Shelf. Here you can adjust hold notifications, download and device preferences and more.